In my first blog post on energy I calculated that worldwide energy production must increase to about 734 exajoules per year in order to raise the standard of living for most people to a reasonable level of comfort. This compares with current energy production of around 474 exajoules per year. It also assumes massive reductions in energy consumption in countries like the United States and Canada. My second post on energy detailed the cost of energy from existing sources and the prospects of using each to meet the energy needs of the developing. Notably, wind and solar are by far the most expensive sources of energy and their environmental impact isn't as neutral as they've been portrayed. The least expensive source of energy is nuclear — beating even hydroelectric power. But we need some changes to the nuclear economy based on technology improvements. We can't continue using the predominant form of nuclear fission without a long-term waste storage plan and safer reactor designs. I'm following four innovative approaches to nuclear energy. Any one of these, if proven viable, promises to offer abundant, cheap and clean energy that can be sustained for millennia. Credit: TerraPower Nearly all nuclear reactors presently used for energy production are thermal reactors which use slow-moving or "thermal" neutrons. The advantages of these reactors are that they can use low-grade nuclear fuel (moderately enriched uranium), they can use water as a coolant and it is difficult to misuse them to create nuclear weapons. Many design variations exist from those of questionable safety like Chernobyl to reliable designs that have operated for many decades. The trouble with thermal reactors is that they require enrichment of uranium ore and they produce nuclear waste that remains dangerously radioactive for thousands of years. In contrast, fast-neutron reactors require more highly-enriched fuel (increasing the risk of weaponization) and more exotic coolants like liquid sodium. However, they have three big advantages. First, the waste from a fast-neutron reactor has a much shorter half-life and requires storage for only a few hundred years. Second, the fast neutrons can be used to enrich uranium to produce more fuel than the reactor consumes. Third, the fast neutrons can be used to reprocess the nasty waste from thermal reactors resulting in a mix of new nuclear fuel and short half-life waste. Many research groups are pursuing variations on the fast-neutron design that capitalize on these advantages while managing the problems of weaponization and exotic coolants. One approach is to have most reactors of the thermal design while a few fast-neutron reactors reprocess and produce fuel for the rest. However, such a nuclear economy requires a lot of transportation and processing of radioactive materials. A traveling wave reactor is a variation on the fast-neutron design that is pre-loaded with a small amount of enriched fuel to get it going and filled the rest of the way with unenriched feedstock. The reaction starts in the enriched section with the fast neutrons enriching the neighboring fuel. The "wave" of the reaction moves from the pre-enriched section through the newly-enriched area until all fuel has been consumed. TerraPower is working on a traveling wave design that could be pre-loaded with enough fuel to last 60 to 100 years. A small amount of enriched fuel (the dangerous stuff) would be loaded with a large quantity of depleted uranium (plentiful and safe to transport) and the whole system buried. When the reactor eventually "burns out" the short half-life waste might be left buried in place while a new reactor takes over. Credit: EMC2 Fusion Nuclear Fusion has long been the holy grail of energy production. It's the primary reaction fueling our sun and the stars. For fusion you take two hydrogen atoms and fuse them using high temperature and pressure to create helium and a lot of energy. The advantages of fusion over fission is that the fuel is plentiful -- hydrogen extracted from seawater being one option -- and the waste is inert helium. It should be noted, however, that most fusion reactions release radiation so the reactor itself must still be shielded. The trouble is that maintaining a controlled reaction has proven to be very difficult. IEC Fusion is one of several approaches that is gaining attention over the more conventional and extremely expensive tokamak. Inertial Electrostatic Confinement Fusion was invented by Philo T. Farnsworth who also invented television. Farnsworth's idea was to place a grid in a vacuum chamber with a strong negative charge. When hydrogen ions are released into the chamber they are accelerated toward the grid and some percentage of them collide in the center with sufficient energy to fuse into helium. The Fusor, as Farnsworth called his device, has been proven to generate fusion. Building one is relatively simple and inexpensive. Many hobbyists have built their own. However, current designs consume considerably more energy than they produce. The main energy leak is that many of the ions collide with the grid itself consuming some of the charge and contaminating the plasma with the products of the (non-nuclear) grid collision. For a little more than a decade, Dr. Robert Bussard quietly researched ways to overcome problems with the fusor. His device, called the Polywell, makes the grid out of coils. An electrical current in the coils creates a magnetic field that guides the ions around it and prevents collisions. He and his team made several important breakthroughs shortly before their U.S. Navy funding ran out. At that point he gave a famous talk at Google in which he detailed the progress they had made and sought funding to continue the research. Unfortunatly, Dr. Bussard died of natural causes before funding was renewed. Thankfully, Dr. Richard Nebel, has obtained funding and continued the work. So far the results are promising and he expects to have proven whether the concept is viable within two years. Credit: Lawrenceville Plasma Physics The Dense Plasma Focus device creates a toroidal plasma by discharging a high voltage arc in a near-vacuum. The electrical and magnetic fields in the plasma torus cause it to collapse into a very dense-hot formation called a plasmoid. Under the right conditions, the plasmoid is dense and hot enough to create nuclear fusion. The fusion reaction releases heat, x-rays and high-velocity ions. The trick is to capture all three of these products in such a way as to generate electricity. Lawrenceville Plasma Physics claims that they have a reactor design that will effectively capture sufficient energy to be a viable clean source of nuclear energy. Most fusion research focuses on the Deuterium-Tritium reaction (Deuterium and Tritium are both isotopes of Hydrogen). That's because it's the easiest fusion reaction to achieve because it requires the least energy. However, both IEC Fusion and Focus Fusion have potential to work with other reactions because increasing the heat is mostly a matter of raising the voltage. This raises the possibility of using a Hydrogen Boron reaction. The advantage of this is that when Hydrogen and Boron fuse they release three Helium atoms and a bunch of energy but no neutron radiation. Thus, a hydrogen-boron reactor wouldn't require heavy shielding. Credit: General Fusion General Fusion proposes to inject a small amount of deuterium-tritium mixture at the center of a sphere of liquid metal. 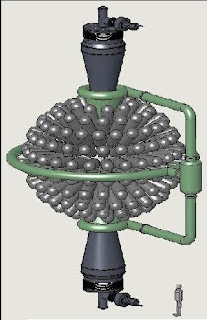 The outside of the sphere is simultaneously struck by hundreds of rams which create a spherical shock wave. When the wave reaches the center it compresses and heats the D-T mix sufficiently to generate fusion. When I first read about the idea, the researchers proposed to use mercury for the liquid metal and steam to drive the pistons. Hence the moniker, "Steam Fusion." 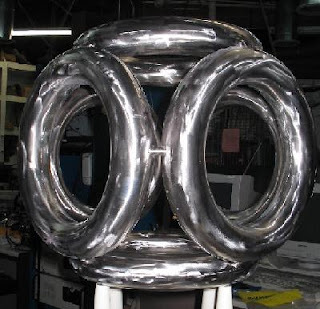 The current General Fusion design uses pneumatic pistons and a hot lead-lithium mix for the metal. They call it MTF Fusion but I think Steam Fusion is more catchy. If proven viable, any of these approaches might deliver plentiful, clean, safe and inexpensive energy. And that combination could bring about societal changes rivaling the Industrial Revolution. All four appear viable on paper which means that there is a very good chance that one or two can be proven viable. The Nuclear Age has been long in coming but I think it's almost here. Idaho National Laboratory's Sodium-Cooled Fast Reactor is designed for management of high-level wastes and, in particular, management of plutonium and other actinides. Alan Evans put me onto your blog as hes a friend of mine. Have you read about Eugene Mallove and his Cold Fusion processes? He was beaten to death in 2005 I think it was a week before he was to garner funds to continue his work, they called it a burglary. It seems that there is a contradiction in the energy circles. While they claim they want a renewable cheap resource to fuel our energy processes, they find ways to remove the people who are making the most progress. There was another inventor who figured out how to make perpetual batteries that died in an airport parking lot on the east coast on his way to go get funding for that as well. Anyways as you work for a large foundation claiming these next generation energy generation methods as the road forward, I'm curious to hear if the foundation you work for is funding any energy veins of research. Not familiar with Mallove's work. I'll look it up. Of course I'm aware of Pons and Fleishman's work in Cold Fusion and it's subsequent debunking. I'm also aware that the debunking is a bit excessive. Low rates of Cold Fusion have been proven. However, I don't think it's as promising as the technologies I cited in this post. The Gates Foundation is not involved in energy research of any sort. However, Bill Gates has an independent connection with Intellectual Ventures and has invested in TerraPower. He has made some very specific statements about energy issues in the last month. I think you could find them with a Google search. I may comment on them in a future post.